The people who ask me such questions seem to think that the IPCC’s increase in confidence is politically motivated, that the process requires a unidirectional progression of confidence in such a key area, and that this provides reason enough to account for the IPCC going against the mounting evidence. Indeed, to them this seems like a no-brainer that proves that the whole IPCC process is corrupt. Now, I don’t know the IPCC’s reasoning process, to the extent that a complex organization can even be said to have a reasoning process. However, those who think that the IPCC is acting unscientifically in this particular matter are failing to recognize something particularly important: despite the growing divergence, the evidence supports increased confidence in the IPCC’s statement. How can this be? To see how, I’ll analyze Prof. Judith Curry’s recent written testimony for the hearing on Obama’s Climate Action Plan at the Senate Committee on Environment and Public Works on January 16, 2014. Her testimony provides the most comprehensive, scientifically accurate, and seemingly logical example of the argument that the IPCC’s increase of confidence is counterfactual. The complete written testimony is available here; I’ll be extracting the key arguments. You can also find discussions of the testimony at Curry’s blog here, here, and here, and a very recent post of hers on the hiatus here. Curry’s testimony focus on three issues; the issue at hand is her first focus. “• After expecting a global mean surface temperature increase of 0.2C per decade in the early decades of the 21st century based on climate model simulations and statements in the AR4, the warming over the past 15 years is only ~0.05C. All of these summary bullets are correct. No disagreement there. This summary is correct. No disagreement there either. Curry’s third point involves sea level rise, and what is causing it. I find her discussion of sea level rise to be weak, but it’s irrelevant to the issue of what’s causing the increase in global temperatures. Rather than get sidetracked, I’ll leave it at that. Curry’s fourth point involves sea ice changes (loss in the Arctic, gain in the Antarctic) and the lack of understanding of the importance of various contributing factors to those changes. I agree with her discussion here too, but like her third point, it’s irrelevant to the issue of what’s causing the increase in global temperatures. Okay, so far, no fundamental disagreements, and in the areas that are relevant for the issue at hand, I completely agree. So where’s the problem? I do disagree here that a “very substantial reconsideration” will be needed. Maybe it will, maybe it won’t. It all depends on the cause of the hiatus. But here’s why none of this means that the warming over the past 60 years is less likely anthropogenic. Suppose we make a generous assumption for the role of natural variability. Suppose we assume that the stadium wave hypothesis is correct. As Curry alludes to, the stadium wave hypothesis posits that there is a regular, propagating, approximately 60-year oscillation in the climate system that, among other things, affects global temperatures. Let’s suppose that it has a pronounced effect, as big an effect as Curry thinks it might have, and is thus responsible not just for the present hiatus but also the hiatus centered on the 1950s. In this best-case-for-natural-variability scenario, natural variability is strong enough to bring global warming to a halt during the negative portion of the natural oscillation, and the present halt is likely to continue for at least another decade. Conversely, during the positive portion of the natural oscillation, natural variability and anthropogenic forcing are working together to drive temperatures upward. Curry alludes to the 1975-2000 period in her testimony. During this period, if we make natural variability as strong as it can be, natural variability would have accounted for about half of the observed warming, and anthropogenic forcing the other half. Since (using GISTEMP) global temperatures went up by about 0.5 C during this period, one would say that natural variability and anthropogenic forcing each accounted for about 0.25 C of warming. That’s 0.1 C per decade, over 25 years. Now suppose we want to isolate the effect of anthropogenic forcing. If the stadium wave is the primary manifestation of multidecadal natural variability, we can do this by simply considering a period equal to one complete cycle of the stadium wave, or 60 years. In 2010, the stadium wave would be in about the same phase as it was 60 years earlier, in 1950. Whatever contribution it’s making to global temperatures in 2010, it made the same contribution 60 years ago. That means that the overall temperature change over the past 60 years is entirely anthropogenic. At a pace of 0.1 C/decade, that would be 0.6 C in 60 years, which is what is shown by GISTEMP. Why does the IPCC conclude that the long-term rise is caused by man? The primary logic is simple, really. Of all the things driving long-term changes in the climate system, the biggest by far over the past 60 years is greenhouse gases. Second on the list is particle pollution, or aerosols, which partly counteract the greenhouse gases. Over the past 60 years, natural forcings (sun, volcanoes) have also had a cooling effect. So arguments over the relative importance of different kinds of forcing don’t really matter for explaining the past 60 years of temperature rise: the only large one on the positive side of the ledger is greenhouse gases. Of course, it’s not enough to say that greenhouse gases point temperature in the right direction. The magnitudes have to match, also. Here, too, the hiatus increases confidence that there’s not some unknown but significant positive forcing agent other than greenhouse gases that’s driving temperature. The smaller the rate of warming, the smaller the possibility that a separate, additional cause of warming is being missed, and that, therefore, greenhouse gases account for most or all of the total amount of warming. Curry is correct that the hiatus and increasing model-observation divergence is evidence that the models are too sensitive to forcing agents, including carbon dioxide. She is also correct that, the stronger and longer-lasting the divergence, the greater the evidence that much of the warming pre-2000 was natural. Likewise, the stronger the evidence that models might be overestimating future warming. Exploring those issues requires evaluation of all the available evidence, not just the last 60 years of temperatures, and will have to wait for another blog entry. But here’s the thing. If, over 60 years, natural variability averages out to zero, it doesn’t matter how strong natural variability is compared to man-made climate change, what’s left over is the man-made part. Thus the IPCC can and should consider it to be extremely likely that human influence dominates the net rise in temperature over the past 60 years. Note that such a statement only works if you look at the temperature change over one complete natural cycle. Over a shorter period, particularly one in which a natural cycle would have contributed to net warming, confidence would necessarily be lower. Now look back at the TAR statement. It considered the temperature change not from 1951 to 2010, but from 1951 to 2000. Over that interval, under the natural cycle hypothesis, much of the warming would have been natural. Thus, if one were to make a similar assessment today, one might indeed conclude that the dominance of man-made effects over 1951-2000 is only highly likely, or perhaps merely likely, much as the IPCC assessed things at the time. For this is another thing that the critics of these statements miss: they apply to different periods. It is possible, indeed it’s strongly supported by the evidence, that the relative contribution of man is larger over the 1951-2010 period than the 1951-2000 period, or especially the 1975-2000 period. If you’re a believer in strong natural variability, and you’re looking to criticize the IPCC, you might complain that they don’t reduce their estimates of climate sensitivity enough, or that they don’t adequately discuss the increased evidence of the importance of natural variability in affecting temperatures from decade to decade. But none of this, and none of the evidence presented by Curry or by anyone else I’ve seen, reduces the likelihood that the temperature change over the past 60 years or so was mostly anthropogenic. *I interpret the increase of temperature from 1951 to 2010 to mean not a linear regression rate of temperature rise, but the absolute change of temperature from the value typical of years around 1951 to the value typical of years around 2010, smoothed to remove short-term El Nino effects and the like. On its face, the statement refers to the amount of temperature change, not the rate of temperature change. The logic behind my reasoning is this. The way the IPCC’s attribution argument is laid out, there are two possible contributing causes to climate change since 1950: anthropogenic forcing, and natural variability. The sum of these two contributing causes is 100%; the chief issue of interest is the relative percentage contributions of anthropogenic forcing and natural variability. The IPCC AR5 makes an extremely confident statement that ‘most’ of the warming is attributed anthropogenic forcing, and I understand ‘most’ to cover a range of 51-95%. The IPCC implicitly recognizes that the attribution issue is uncertain by not giving a distribution of values or a ‘best estimate.’ Rather, they provide a bounded region that covers ~44% of the possible territory. [N-G: It can be a bit misleading to express this in terms of percentages. When most people see percentages, they imagine small positive numbers that collectively add up to 100%. However, different agents of climate change can have positive (example, increasing greenhouse gases) and negative (increasing aerosols) contributions. Pick a random time interval, and natural variability is just as likely to make a negative contribution as a positive one. Curry’s assumption that the IPCC means ‘most’ in this context to cover a range of 51-95% is flat-out wrong. Here’s the full quote from the Summary for Policymakers: “It is extremely likely that more than half of the observed increase in global average surface temperature from 1951 to 2010 was caused by the anthropogenic increase in greenhouse gas concentrations and other anthropogenic forcings together. The best estimate of the human-induced contribution to warming is similar to the observed warming over this period.” They explicitly state that their best estimate for the human-induced contribution is about 100%, which is outside the range that Curry assumes they mean! In the absence of a compelling theoretical reason for the lower bound of 51%, I infer that the IPCC does not regard a high likelihood for values of anthropogenic forcing less than 60%; otherwise it would be difficult to argue that the lower bound would not be breached. At the time of the AR4, in talking with IPCC lead authors I had the sense that most of the scientists thought that the anthropogenic contribution was >90% (this is my subjective assessment; I would be interested in other documentation on this). The elements of greatest certainty in this argument are the components of anthropogenic forcing. The elements of greatest uncertainty are the sensitivity to CO2 (and the fast thermodynamic feedbacks), natural internal variability, and then there are also the unknowns such as solar indirect effects. Comparing trends from the CCSM4 ensemble to observed trends suggests that internal variability could account for approximately half of the observed 1979–2005 September Arctic sea ice extent loss. So . . . this evidence all acts to lower the contribution of anthropogenic forcing, and increase the contribution of natural variability, and I would argue that this lowering should not be regarded as trivial. Yes the 44% provides lots of wiggle room, but it is not unreasonable to infer, based on the evidence provided by the IPCC that the anthropogenic component has dropped below 70% and even below 60%. In this light, putting an extremely confident lower bound of 51% seems insupportable. Particularly in light of the unknowns such as solar indirect effects. N-G’s reasoning about how to think about the relative contributions of natural vs anthropogenic anthropogenically is something like the way I have approached this, but not quite. I look at it the following way. Consider two periods: 1975-1998 (warming), and 1998-2013 (hiatus). Play with the percentages of natural variability (assuming warming in the first period and cooling in the second period) and anthropogenic forcing, accounting for the relative lengths of the two periods, and see what percentage breakdown works for both periods. And what the implications are of the hiatus extending another 10 years. You will not get numbers that exceed 75% for anthropogenic. If I were given a 44% range to work with, I would put the range at 28-72% anthropogenic. My range overlaps with the IPCC in domain 51-70%, but I also allow for numbers below 50%. The main uncertainties seem all in the direction of increasing the contribution from natural variability. Bottom line: with the growing recognition of the importance of natural variability, it is increasingly difficult to defend the bottom bound of 51% for anthropogenic forcing, hence I find the increase in confidence to ‘extremely likely’ to be unjustified. Your overarching point is important and well taken: Even *if* natural oscillations are as strong as Curry claims, over longer timescales their effect on global average temperature averages out to zero (unless she wants to throw conservation of energy out of the window). You make a cogent argument that her stadium wave hypothesis has no bearing on the attribution of the temperature increase since the 1950’s. However, I think that’s a pretty big *if*. Curry’s stadium wave hypothesis is not much more than a curve fitting exercise, without a plausible physical explanation. But also on other points where you agree with her testimony, I would be far less agreeable. Her testimony was rhetorically strong, but scientifically weak. For example, she is too quick in jumping to the conclusion that climate sensitivity is overestimated. That judgment is based on a very limited selection of the available evidence. Taking all evidence into account (e.g. 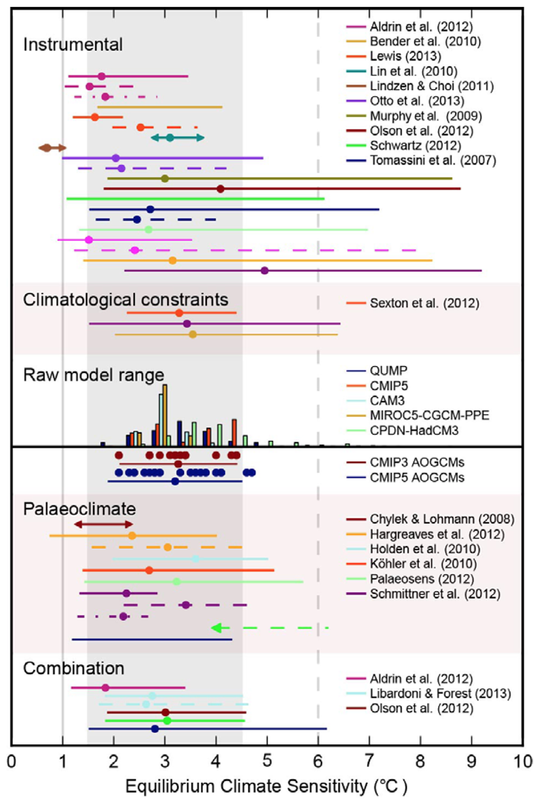 also from paleoclimate and from climatological constraints), the picture regarding climate sensitivity remains very much similar to what it’s been for decades (http://klimaatverandering.files.wordpress.com/2013/10/ipcc_ecs_pdfs_box12-2_fig11.png ). I’m puzzled by Curry on the one hand exaggerating uncertainty to the point of claiming ignorance (e.g. regarding the pause, for which many plausible mechanisms have been proposed), and on the other hand so confidently stating that climate sensitivity must be at the lower side of the range. She only focused on one preferred cause without mentioning other possibilities. And there are indications that over the past decade or so there are some additional negative forcings (e.g. from the quiet sun and from volcanic and Chinese aerosol); that there is a cool bias in the main surface temperature datatsets (by excluding the rapidly warming high Arctic); that internal variability was predominantly in the cooling direction (La Nina). Perhaps most importantly, the climate system has continued to build up heat, predominantly in the oceans. To put the so-called hiatus in the perspective of the planetary energy budget, look e.g. at the purple line at the bottom of this graph (http://www.easterbrook.ca/steve/wp-content/IPCC-AR5-WG1-Box-3.1-Fig-1.png ), and compare it with the other contributions to the increase in energy content. Regarding climate sensitivity, are you referring to something other than her written testimony? In her written testimony, she does not conclude that ECS is overestimated, just that the IPCC has lowered the lower end of its range and that there’s a sizable difference between observation-based and model-based estimates. She doesn’t say whether she favors one group over the other. I consider paleoclimate-based estimates to be a third class, apart from observation-based and model-based, and they deserve mention too. As it happens, they collectively span the range of most observation-based and model-based estimates, so they don’t allow us to exclude one group or the other. Their main value is in showing that both of the other groups are reasonable in the context of past climates. This is an extremely valuable discussion & thanks for having it. One question that might reveal my poor understanding of the debate: If natural variations in global temperature average out to zero over a full cycle, and we agree that our measurements span at least one full cycle, and we also agree that our data (passed through a filter with a window size approximately equal to the period of this cycle) shows the average temperature increasing, then are we not forced to conclude that this change must be due to something other than natural variation? Which of those assumptions does Dr. Curry disagree with? I can imagine one argument being that there are many natural cycles superimposed & occurring with different frequency and we have yet to successfully isolate them all. Natural variations includes “known and unknown” natural variations, and in the climate system on these time scales they tend to be more chaotic than periodic. Unforced natural variations on century plus time scales are especially fuzzy, because there can be no direct modern observational evidence. One must rely on accurate reconstructions of paleoclimate variability (challenging) or variability that emerges from multi-century climate system simulations (useful mainly in forming hypotheses, but not much more). Given their unverifiable nature, unforced century plus natural variations should be treated as a hypothesis of last resort, after attempts to explain variations by known mechanisms fail. At present, there’s no residual century-scale temperature signal that hasn’t already been explained by variations in forcing. I choose the knowable over the unknowable. Why betting on unsubstantiated, deus-ex-machina style variability as a post-hoc rationalization when we have a physically plausible mechanism that explains most of the large scale features of our climate system and the changes therein. Also, it would be very interesting and helpful to read a post summarizing what you believe to be the most convincing pieces of evidence (new data or new analyses of old data) that the IPCC has for raising the confidence level above their previous estimates. Thanks! The newest thing is a bunch of attribution studies on global temperatures. They’re summarized in a figure posted at Skeptical Science http://skepticalscience.com/jones-2013-attribution.html , see the caption for specific citations. The IPCC report itself (AR5 WG1 Chapter 10) contains their analysis of the evidence. I do not agree with the characterization that there is a hiatus. If we look at the global temperature record from NASA from 2001-2013, every year would have broken the global temperature record up to 1998, for global temperatures since 1880. We went from 1998 being a once in a century event for the 20th century, to every year now being near that level. The decadal temperature record does not show a hiatus. We have had five of the last six years influenced by La Nina , which is why I am amazed at how warm 2012 and 2013 have been globally. What’s your definition of a hiatus? Your statistics argue for the absence of a decline, not the absence of a hiatus. Unless the hiatus spans two full decades, it won’t show up on the decadal temperature record. If you’re trying to argue that it wouldn’t exist at all without the effect of ENSO variability, then I’m with you. But: the 15-17 year trend is near zero, and no such interval has occurred since the 1970s. This is an observed feature of the climate record. We have to call it something in order to talk about it. In the geologic context a hiatus is a discontinuity in a temporal record. I do not see a discontinuity in the record of warming since 2001-2010 is the warmest decade, and 2003-2012 is an even warmer decade, it is not up to the selection of a single year, the last decade is the warmest. That does not amount to a hiatus. This is also true in other data sets that are temperature controlled. Glacier mass balance had its most negative decade 2003-2012, 2013 data not in yet. I think we’re splitting hairs. In GISTEMP, 2002-2011 was the warmest decade, 2001-2010 was second warmest, and 2003-2012 and 2004-2013 tie for third. These past two overlapping decades are the first since the resumption of sustained warming in the mid 1970s that did not either set a new record or come in second. In RSS, 2004-2013 is the seventh-warmest ten-year period. Warmest was 1998-2007. In HadCRUT4, 2004-2013 is slightly cooler than 2003-2012, which was slightly cooler than 2002-2011, which was slightly cooler than 2001-2010. The UAH temperatures behaved the way you reported. Realclimate’s new article on global temperature examines the data sets a bit, Cowtan and Way (2013) end up without a hiatus with a scheme that better accounts for areas with poor spatial coverage. They do have 2013 warmer than 1998. Estimation of surface temperature changes in poorly-covered regions is enough to reverse the slight cooling in the recent decadal averages in HadCRUT4, turning it into a slowing rather than a hiatus according to your definition. Pingback: The logic(?) of the IPCC’s attribution statement | Climate Etc. Pingback: ‘Most’ versus ‘more than half’ versus ‘> 50%’ | Climate Etc.